Let’s all take one big breath in and let it out slowly, because it’s time for a look back at…Horizons. 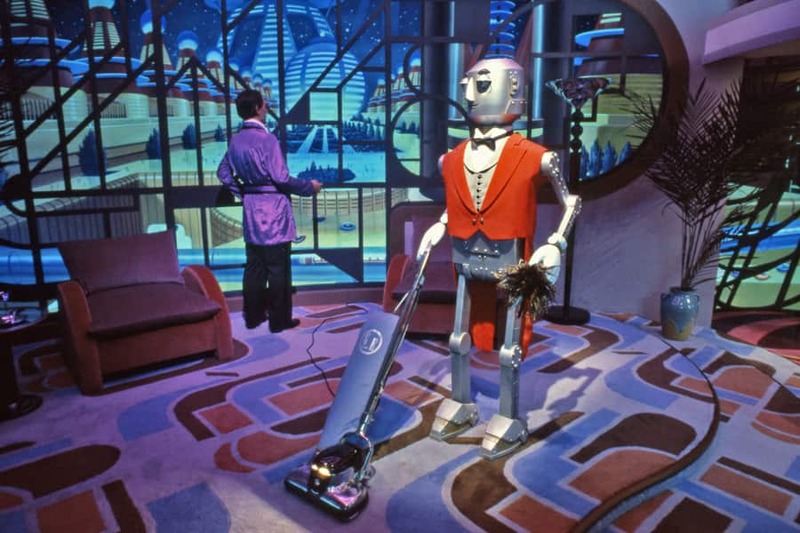 Although it’s now a thing of the past, Horizons, the attraction that took guests on “an exciting exploration of options for living and working in the 21st century,” continues to be an Epcot fan favorite today. 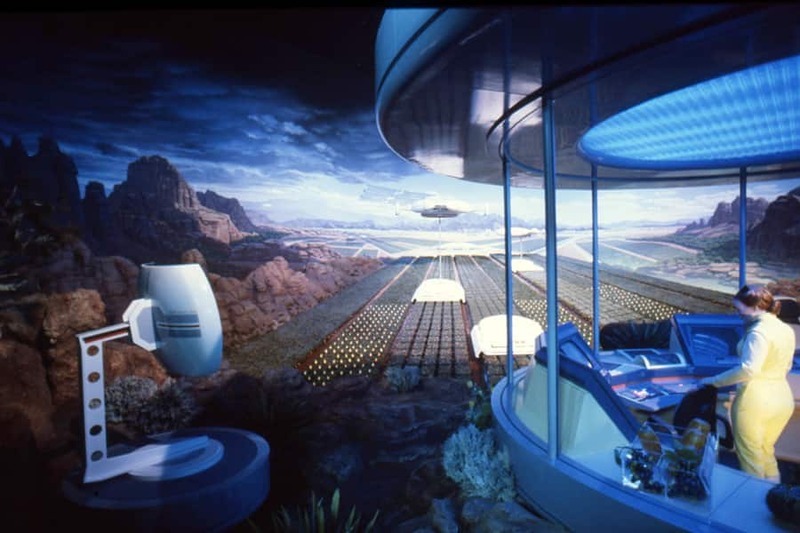 Called a “mind-boggling 15-minute journey” aboard a suspended vehicle, the first scene in Horizons was titled “Looking Back at Tomorrow” and offered a glimpse at past visionaries and views of yesterday’s future. Included in this area is one of the most iconic figures in Horizons, the Robot Butler. Horizons also took guests to Nova Cite a community of the future where the use of a “holographic telephone” helped families keep in touch. It doesn’t matter where I am at; the smell of citrus will always evoke fond memories of Horizons. Okay so I am 21 years old so I never got to experience Horizons first hand, however after reading everyones comments and how much you all loved it, I became very curious. So I went to youtube and found a video made by disney about Horizons. All I have to say is that this ride was AWESOME! I am totally into classical disney- if given the choice between a thrill ride or a ride that teaches you something/ entertains you I would totally go for that one over a thrill (even though those are fun)! I wish that they could make this ride again. I also think that it is so cool that Horizons is the only ride in Disneyworld that still ran without being sponsored! It just seems that it was awesome in the 80s and 90s because it sort of predicted the future. We kind of have the birthday party scene through facetime! I also looked into Journey into Imagination and World of Motion, but Horizons was by far the best!!! Anyone who really misses it can go to youtube and watch! My husband Kevin and I miss this a great deal too. Love the citrus smell just like everyone else!! Wish it was still at EPCOT !!! You could ride it over and over.. where you can’t really do that with “Mission”. Such a perfect ride that represented what EPCOT was all about. Would be awesome to see more pavilions like this at EPCOT again. Horizons, Wonders of Life, Universe of Energy playing Energy (you make the world go round), Space Ship Earth playing Tomorrow’s Child, Epcot Entrance Music, Captain EO (Gratefully it’s back)! Epcot was always may favorite one! I miss Horizons! It was my family’s favorite ride at Epcot. I know it goes against Disney’s market research, but I bet if Horizons was brought back that it would be a huge hit. Captain EO was brought back so you never know. Horizons, it does not get much better than that ride. Heck it was more than just a ride it was an experience. Once you walked through those doors, you were no longer in Epcot, you were transported into the future, to another time. Horizons was and still is Disney Imagineering AT ITS BEST! Great seeing shots! I miss horizons!! Great post. It would be really nice to see a new pavillion at Epcot that gives us some hope, teaches us something, and still thrills us at the same time…Epcot was a wonderful look to the future…something I think we all need. Rides like this should make a comeback! Horizons was one of my FAVORITE RIDES EVER at Epcot. Their biggest mistake was getting rid of “Journey Into Imagination,” but Horizons could be a close second. I really miss them both!!! Man, I LOVED that ride!!! Thanks Nate for posting this look back at Horizons. 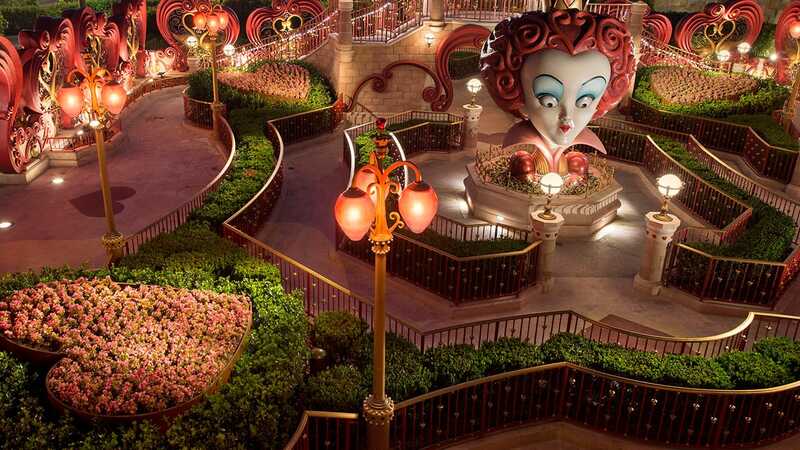 Thanks to the internet, this attraction will be kept alive in cyberspace through it’s many fans who have created a multitude of multimedia tributes. I really miss Horizons, I hope someday they will read all the feedback from us and possibly consider bringing Horizons back to life. 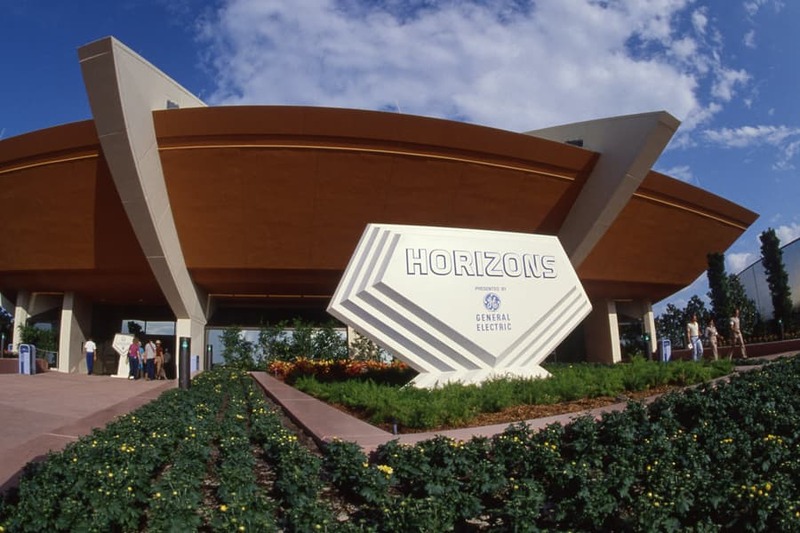 Horizons was beyond a doubt one of the best attractions at EPCOT. Horizons was Epcot’s Future World to me. It was the only pavilion to focus solely on the future. At least I have a video recording of a ride-through, and I spray my face with citrus oil at the appropriate moment. When I see these pictures, it brings back fond memories. As much as I like Mission:Space, its truly a shame that Horizons, which was nearly a perfect classic Disney experience, needed to close for it. Would love to see something of a similar scale as Horizons return to Walt Disney World resort. just out of curiosity, will you guys renovate Innoventions at Disneyland? We all miss Horizons! Why did this attraction disappear? While we can’t bring Horizons back, I sure would LOVE to see a similar type of attraction return to Horizons (Wonders of Life pavillion–cough cough). Horizons = EPCOT for me. I miss Horizons, World of Motion and the original Imagination pavilion so much. They made my imagination and spirit soar. Every time I visited WDW, I went on them over and over, never tiring of them. They were Disney attractions at their best. Epcot is not the same without them. Nate – kudos on another great EPCOT Center post! I have never seen the first photo before… The interesting angle made for a beautiful picture! Like everyone else who has already commented: I cannot put into words how much I truly miss this attraction. Great music, great storyline, amazing technology… Take me back to Mesa Verde! It’s true, it make you want to live in the future, I was ready to explore this future. As much as I like Mission Space, you don’t get that sense of wonderment and hope. I miss this attraction. 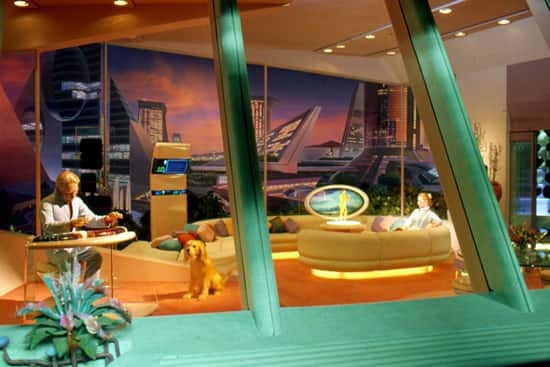 I really really loved Future World as a kid, because it allowed me to think about the future in new and interesting ways. They might not have been thrill rides, but rides like Horizons and The World of Motion were packed with interesting and fun scenes and always had me coming back. I loved this attraction! It is interesting how much of the visions of communication have or are coming true. I completely agree with Jeremy & Adam! Horizons was my favorite ride and World of Motion my second. I always wanted an apartment with that view! Of course, every time I smell oranges, I think back to the ride…anyone remember another goodie that had this song (at MK and presented by Delta)…”If you had wings….?!! This was my absolutely, without a doubt, very attraction. I miss it soooooooooo much. Thank you for sharing this. It is very bittersweet. I don’t think I’ll ever stop missing this one. AHA!! I was trying to remember this attraction the last time I was there! Thanks for jogging the memory!! Words really cannot express how much I miss this attraction, easily my favorite of all times. This along with WOM and the original JII were true Disney Classics. I miss Horizons so much. I was heartbroken when it closed. Favorite pavilion at EPCOT Center. I can smell the oranges from here! Such a great attraction! The sequel to Carousel of Progress. It would be nice to see it return in some form. My all time fav since Epcot opened thirty years ago when I was fifteen. Yes when ever I smell orange it does take my back to Horizons! I was heart broken when it closed and missed out on riding it one last time. This was one of my all-time favorite attractions at Epcot (along with World of Motion). I have to agree with you, Nate, that the smell of citrus will always remind me of this attraction! I wish this attraction had lasted a little longer. I have very vague memories of it and World of Motion. I was too young when I rode them. Thank you very much for the post! Wonderful memories! I really miss this attraction. It was a great sequel to Carousel of Progress. It really made me want to live in the future.